As for all this rain -- "we need it," right? No, we don't. 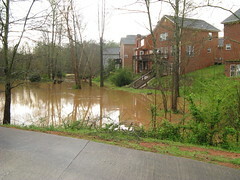 If Lake Lanier and Lake Hartwell are still low, they are in different watersheds, so rain in Athens doesn't help them. Okay, so this isn't specifically Athens related, although some may want to participate. For those who might wish to participate in Earth Hour tonight @ 8:30. The Walter J. Brown Media Archives & Peabody Awards Collection at the University of Georgia Libraries will host Ambassador Andrew Young as he presents the premiere of his new feature-length civil rights documentary, How We Got Over, at 7 p.m. on Monday, March 30. The event, in Room 102 of the Miller Learning Center, is free and open to the general public, as well as UGA students, faculty and staff. How We Got Over uses unique archival footage from the WSB and WALB Newsfilm Collections to re-frame the story of the civil rights struggle. The immediacy of this footage, mostly unseen since the time of its original broadcast in the 1950s and ‘60s, brings our nation’s struggle for racial equality to life. An abridged version of the documentary was broadcast nationally as an episode of the series Andrew Young Presents. The feature-length version, to be seen here for the first time, includes never-before shown material, including a 2009 interview with Charlayne Hunter-Gault, one of the first African Americans to attend the University of Georgia and an alumna of the Grady College of Journalism and Mass Communication. Young will introduce the film and answer questions after the screening. How We Got Over draws on raw news footage from WSB-TV in Atlanta and WALB-TV in Albany. Held by the UGA Libraries’ Walter J. Brown Media Archives and Peabody Awards Collection, the moving images—about 450 clips—cover a broad range of key civil rights events. The clips also provide the foundation for UGA’s Civil Rights Digital Library. For more information see www.andrewyoung.org or http://crdl.usg.edu. REMINDER: Bargainza starts TODAY at 6pm!!!! Diamond in the Rough Area: Rare and valuable items will be identified by an antique dealer & put on special display for sale. We are Having a Gold Rush: Preview Night Gold Exchange. Bring in your gold jewelry and trade for cash! Day Of Sale: Saturday March 27th 8AM-1PM Tickets $3. All items tagged price. The Georgia Masons will be there to help generate identifying items of your child for you to take home, including impressions of your childrens teeth and mouth. In the event your child is missing, you can provide the GACHIP PACK to law enforcement as an aid in recovery and identification. GACHIP is a part of MASONICHIP which is recognized by the NCMEC as one of the most comprehensive child ID services available. All identifying items in the pack are provided FOR FREE. Plus: Boating for Bargainza: Raffle to Win a Royal Caribbean Cruise from Global Escapes. Sat, April 4 @ 10. A Road race/walk in the evening? Coming up Katie Lane? I will have to bust out the water table to pass out rehydration to those taking part in the St. James United Methodist Church 5k starting and ending at Watkinsville First Baptist Church on Simonton Bridge Road. Downtown business owners are right about the need for two-hour street parking. (See this article about a petition asking the Mayor and Commission to reconsider a recent vote that increases parking fines and shortens the time on some parking spaces.) Some of my visits downtown are only to eat lunch, and a one-hour limit is insufficient. I often park in the College Avenue deck, but it fills up frequently since it isn't large enough to accommodate diners and people with business downtown. One hour for parking is only sufficient for shoppers, but downtown isn't as much of a shopping district as it is a dining and business district. As for myself, I go downtown for dining and for government business. I either try to park in the College Avenue deck or find a two-hour space on Hancock Avenue. There is certainly a need for two-hour spaces -- why is this so hard to understand? Yes, the shortage of spaces allowing parking for more than one hour definitely discourages my visits. What about you? Officials of the Athens-Clarke County Unified Government will hold a public hearing on the Recovery Act: Edward Byrne Memorial Justice Grant (JAG) Formula Program on Thursday, March 26, 2009, at 6:00 p.m. in Commission Chambers, City Hall, 301 College Avenue. As required by Recovery Act Grant guidelines, the ACCUG will conduct this public hearing to receive citizenry input on a spending plan for the available $222,330 to prevent and control crime, improve the criminal justice system, and other purpose areas. Ok, I know this is not Athens, but it's nice to see that Commerce is trying to grow their art scene. Tickets are on sale for the recession-special price of $8 each. They are available at City Tire in downtown Commerce. Performance is in the Commerce Cultural Center. and Photoshop software. Jim is a retired UGA media producer. He has taught photography for the last 35 years and has worked with digital imaging for the past 20 years. He presently teaches a course at the Georgia Center for Continuing Education. Meet and Greet in the Small Conference Room after program. Light refreshments will be served. Co-sponsored by Clarke-Oconee Genealogical Society (COGS) and the Athens-Clarke County Library Heritage Room. more information, please call 706-353-2287 or visit athenshumanesociety.org. This includes 3 of my works -- including one specially created for AAHS. I am also trying to take advantage of other free social media stuff, like facebook. So I now have a facebook group JUST for my artwork (1-2 updates per week at the most) . Any facebook user can join (no "friending" involved) I'll be posting a new Photo Friday (sometimes Athens, more likely not), info about upcoming exhibits and reception invitations (I really am trying to get back to my artwork), as well as new artwork and inprocess pieces. Note> GMOAn GMOA North is the "old art school" aka Lamar Dodd adjacent to the UGA Main Library on Jackson St. Parking is available in the North Campus parking deck (some exceptions on UGA Football game days and other UGA events). Please visit our blog for updated daily doings on every GMOA event and the latest news at http://gmoa.blogspot.com, as well as links on art and culture. This week with the Georgia Museum of Art, GMOA on the Move is in full swing! Come celebrate St. Patrick's Day the GMOAn way as The Art of series kicks off this Tuesday, March 17 from 6:00 to 8:00 p.m. The Art of: Brew will be held at the world-famous Terrapin Beer Company where attendees will take the tour and learn the art of brewing beer! Also this week, join us for the final Pierre Daura Curator candidate lecture held at the Visual Arts Building (GMOA North) in Room 116 this Thursday, March 19, at 4:00 p.m. Alexandra Karl will present the lecture "Cercle et Carré: Reconstructing the Events." Come tour the world-famous Terrapin Beer Company and learn the art behind brewing award-winning beer. Tours will be followed by a reception and music. $20 Friends of the Georgia Museum of Art, $25 non-members or with a new Friends' membership, admission is $10 per person. RSVP 706.542.0830. Alexandra Karl, who currently teaches art history at the University of Utah, will present "Cercle et Carré: Reconstructing the Events." The above programs are a part of GMOA on the Move. For more information "The Art of" series and GMOA on the Move, please visit us at www.uga.edu/gamuseum. Athens-Clarke County is resuming normal leaf and limb pickup service today, though the rounds are expected to take 15 weeks rather than the usual 8. Regular service was suspended on March 2 so the crews could assist with cleanups related to clearing roadways and public safety issues. The normal size limits will be waived, and the regular crews from the Solid Waste department will have additional assistance from Public Works and Landscape Management to deal with the extra debris. Residents can take their materials to the landfill as usual, though there has been no waiver of fees there ($9 per truckload). A week or two ago, a Harvard economist, writing in the Times, urged those of us who could afford it to redo our kitchens to help get the economy moving again. Pat and I had to chuckle. We’d already started, or she had, spurred not at all by economic patriotism, but by a mature conviction that thirty years was more than enough time to gain full appreciation of the muted beauty of cornflower blue. And she’s still at it, sanding and painting and sealing and moving things there and back again. It’s how she spent the day yesterday. I manned my post in front of the iMac, preparing home-school lesson plans for seventh-grade life science. Anyway, we’d both put in a good day’s work, and it was chilly and rainy, so we decided to have Chinese delivered. We called Golden Sun, just down the road next to the east side Wal-Mart. I can’t remember the last time we had Chinese! Pat picked — mu shu pork and shrimp fried rice. And I had to have my egg rolls. When Golden Sun is on its game, there’s nothing better in Athens. And last night, Golden Sun was on its game. The aroma of those mu shu pancakes when Pat unwrapped them was out of this world. The shrimp in the shrimp fried rice was plump and pink and juicy. Everything was fresh. I put on two pounds! So now it's back to the South Beach Protein Bars as penance. Jittery Joe's is offering a coffee blend called Alternative Fuel. A percentage of the sales go to support BikeAthens, an organization that supports alternative modes of transportation, including cycling, pedestrian, and public transit options. This coffee is roasted locally and can be ordered online or enjoyed by the cup at Jittery Joe's cafés. Heroes Breakfast will be held on May 13th, 2009 at the Athens Country Clubfrom 7:30 a.m. â€“ 9:30 a.m. The Heroes Breakfast is generously presented by Athens Regional Medical Center. To nominate your hero, please fill out a nomination form at http://eastgeorgia.redcross.org/HometownHeroes.htm or call (706) 353-1645. Nominations are due no later than April 13, 2009. The Heroes Breakfast honors local people for acts of great bravery, dedication and service to the community. American Red Cross East Georgia Chapter hero categories are listed below. Where does your hero fit in? An individual(s) who courageously and selflessly responded to an unusual, significant or unexpected crisis. Presented to an ordinary citizen who has used lifesaving training to save the life of an animal. An individual(s) who displayed leadership and commitment to his/her community by making a positive, noticeable and significant impact in society. An individual(s) who showed concern and worked to improve the safety and well-being of his/her community. An individual(s) who exhibited heroic efforts in response to a natural disaster or emergency situation, providing relief to victims. During a time of crisis, provided medical assistance including CPR and/or first aid to a person or people in need. A professional or volunteer firefighter(s) who acted above and beyond the call of duty, exhibiting heroism either in response to an emergency situation or through an ongoing commitment to the community. A professional police officer(s) or related law enforcement official(s) who acted above and beyond the call of duty, exhibiting heroism either in response to an emergency situation or through an ongoing commitment to the community. An active, reserve, or retired member of the Armed Forces or ROTC who acted above and beyond the call of duty, exhibiting heroism either in response to an emergency situation or through an ongoing commitment to the community. A licensed and practicing nurse, nursing student, or retired nurse who exhibited heroism either in their response to an emergency situation or through an ongoing commitment to the community. Presented to an ordinary citizen or professional rescuer involved in rescuing a person in a water environment. Nominees must reside or work in one of the thirteen counties served by the East Georgia chapter. The chapter serves Banks, Barrow, Clarke, Elbert,Greene, Franklin, Hart, Jackson, Madison, Morgan, Oglethorpe, Oconee and Walton counties. A selection committee comprised of community leaders from all thirteen counties will choose the award recipients. Award recipients will be recognized at the Hometown Heroes breakfast to be held May 13th, 2009. Join us for the opening reception of fiber artist Rene Shoemaker's new exhibit "ORR2: Interpreting the Legacy," an artistic interpretation of Fred J. Orr's architecture. Exhibit will be open April 1 - 30, 2009, in the Circle Gallery (G14 Caldwell Hall) at the University of Georgia. 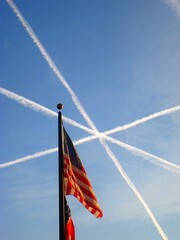 Jet trails over Oconee County as captured by Ezra F.
Post your snow day stories here in the comments. The view from our window. 1:35 PM. 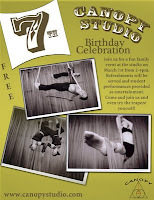 Join us for a fun family event at the studio on March 1st from 2-4pm. Refreshments will be served and student performances provided as entertainment. Come and join us and even try the trapeze yourself!